We hope you have fun at our party, and we can't wait to see what everyone links up ! These easy and cute felt flowers can make some wonderful and cute wreaths, or can be used for any other project you want. 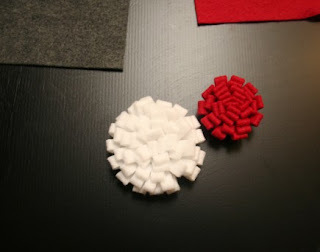 Go over and check our the blog Mrs Priss and let her teach you how to make them. I made my own in just like 3 minutes. It is definitely an easy flower to make, and different than most I have seen! I love it! Thanks for teaching me! Marilyn from 4 You With Love shares a wonderful family table game with us...something that will make dinner fun for everyone! She even shares a great memory from her own family when they played this game! Part of it allows adults to act as children, and the children to act as adults! 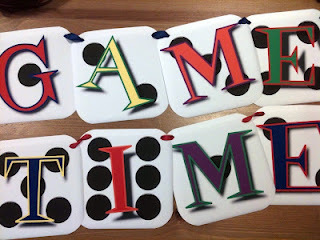 It is fun for everyone, go check out all the details and try it with your own family tonight at dinner. 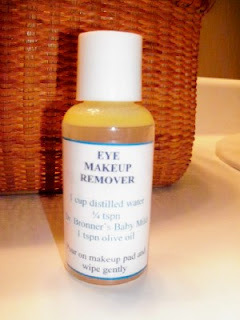 Lynn over at Scrapity Anne gives us a recipe for an amazing eye makeup remover. As I woman, I know how hard it is to get that stuff off, and the clothes and stuff you can buy to help add up $$$ so I am excited to try this out and save some money in the process! Head over to her blog to get this great recipe! 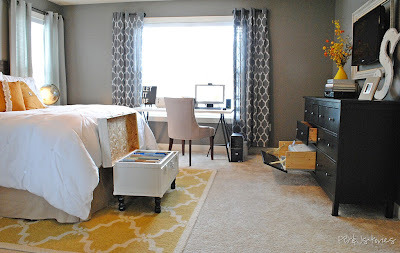 The room makeover at PB&J Stories is one of my favorites this week! Not only because of my love for yellow and gray and me being envious of wanting my room decorated in those colors, but because of all of the great stuff she did here! I love the different patterns together, the way she is able to use space for an office area, and just the entire transformation of the room is huge! Plus have you noticed the hidden organization she has here? Her cute trunk bench at the end of her bed doubles as a filing cabinet, and she uses one of the drawers in her dresser to put her printer! It is great! Head on over and check it out! And this week we finally have a feature blog that was chosen by YOU! We give our readers the opportunity to like the links they have visited, and the one with the most likes will be the Reader's Choice Feature! This week, that award goes to Bumblebee & Sophie who was also featured here last week for her wonderful sewing skills! Stop by and check out the wonderful Valentines gifts she made! There are multiple different ones, all so unique and fun and so well sewn. 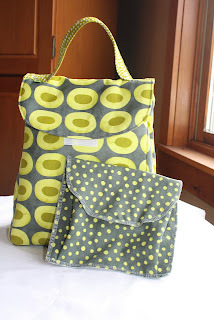 Here she has made a cute lunch bag, and another one of my favorites are the mittens she made! Be sure to stop by and check her out! Now...for the Naturally-Nifty Linky Party #4! Remember link up all your favorite things! We want to see it all. If you'd like you can also stop by our facebook page and LIKE us there too! Older PostWho says that Funnel Cakes are only for the Fair? !